Zhubei (Hakka PFS: Chuk-pet; Hokkien POJ: Tek-pak) is a county-administered city and the county seat of Hsinchu County, Taiwan. Over the recent years, Zhubei has become a popular city for migration both because of its proximity to Hsinchu City and the Hsinchu Science and Technology Park, and because the Hsinchu County government has focused most of its infrastructure here. In 1920, the area of Chikuhoku Station (Japanese: 竹北驛) was formerly called "Angmo Field" (Chinese: 紅毛田; Pe̍h-ōe-jī: âng-mn̂g-chhân; literally: 'red fur field'). In 1941, Kyūminato Village (舊港庄) and Rokka Village (六家庄) merged to become Chikuhoku Village (竹北庄) under Shinchiku District, Shinchiku Prefecture. 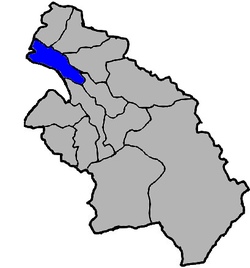 Zhubei was originally a township under Hsinchu County from 1950-1988. In October 1988, Zhubei Township was promoted to a county-controlled city. Zhubei borders Hsinchu City to the southwest, Xinfeng and Hukou Townships to the north, Qionglin and Xinpu to the East, Zhudong to the southeast, and the Taiwan Strait to its west. It is the discharge point of the Fongshan River and the Touqian River into the Taiwan Strait. 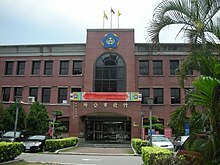 Zhubei has been a satellite city of Hsinchu City since Hsinchu City reformed to become a special municipality in 1982. Due to the separation of Hsinchu City from Hsinchu County and Zhubei becoming the Hsinchu County seat, as well as its proximity to the Hsinchu Science and Technology Park and the semiconductor industry, the city has acquired an increasingly large amount of capital inflow from government, as well as a rapid population increase and a resulting spike in real estate values. The city's population was estimated at 176,966 in January 2017. The city is administered as 30 villages: Aikou, Baide, Beilun, Beixing, Chongyi, Damei, Dayi, Doulun, Fude, Lianxing, Luchang, Mayuan, Shangyi, Shixing, Taihe, Tunghai, Tungping, Tungxing, Wenhua, Xingan, Xingang, Xinguo, Xinlun, Xinshe, Xinzhuang, Xizhou, Zhongxing, Zhubei, Zhuren and Zhuyi. The agricultural aspect of Zhubei has shifted from mainly rice paddy farming to more floral and fruit cultivation that attracts tourists; however the majority of the local economy is now fueled by the semiconductor industry, real estate speculation and the service sector. Parts of Zhubei City have retained their traditional infrastructure following the demolition of the old city. There are also industrial parks in the city, which are the Hsinchu Biomedical Science Park and the Tai Yuen Hi-Tech Industrial Park. National Taiwan University of Zhubei (focuses mainly on institutional research). National Taiwan University of Science and Technology of Zhubei (under construction). ^ "About Us". hsinchu.gov.tw. Hsinchu County Government. Retrieved February 28, 2017. ^ 106年1月 新竹縣人口統計報表 [Table of Hsinchu County Population Statistics, January 2017]. hsinchu.gov.tw (in Chinese). Hsinchu County Government. Retrieved February 27, 2017. ^ 竹北市各里里圖 [Maps of Villages in Zhubei City]. chupei.gov.tw (in Chinese). Zhubei City Office. Retrieved February 28, 2017. Wikimedia Commons has media related to Zhubei City, Hsinchu County. Wikivoyage has a travel guide for Zhubei. This page was last edited on 21 November 2018, at 13:51 (UTC).